High School Students, you may be interested in seeing a few new examples of portraits here. I've also added a little overview of the possibilities, to get you thinking about what we can create for you. OK, I'm not that ancient! This is a beast that I picked up about a dozen years ago, when I tried to have enough time to enjoy playing with older types of film. 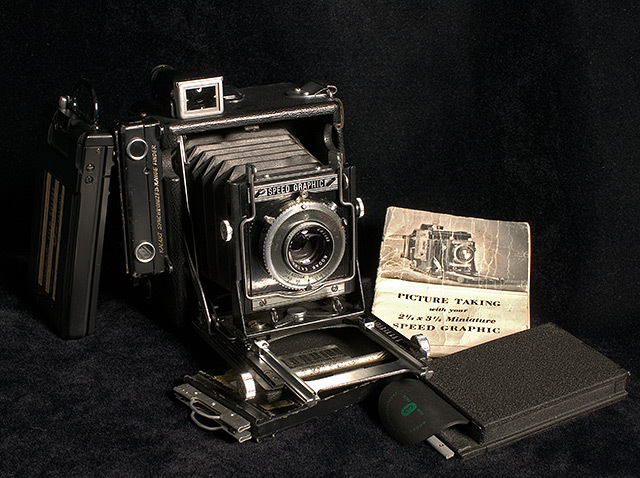 As you can see from the owner's manual, it's a "Miniature" Speed Graphic (World War Two era), which uses 2 1/4 x 3 1/4 sheet film. I've assembled the three ways it could handle the film: "individual" holders for two sheets (remember to remove the dark slide while making the exposure, and to put it back in when removing the holder to flip it to the other side for the second sheet! ), a "Grafmatic" back that held six sheets and managed to pull one around the stack with levers, and a pack that used thinner than usual film and pulled it from front to back using simple paper tabs. The whole pack would get replaced in the darkroom. The Grafmatic and individual holders were loaded a sheet at a time in the darkroom. A bit of a challenge to use! The photo was created with a relatively recent model of digital SLR. Actually, the 4+ year old Canon 1Ds is almost ancient by the standards of the digital world, in which cameras and other devices are often considered obsolete within a year of their appearance. However, the1Ds is still a highly capable camera, much less of a limitation on results than any of us are with our human foibles. Still, it was "downgraded" to second tier in my arsenal three years ago. Film cameras tended to remain in a professional's kit for many years, sometimes decades; perhaps digital cameras are reaching the point of maturity where they will be treated the same way - but there's no reason to expect the technology itself to slow in development. Nor would I want that. I will personally enjoy seeing as much amazing technology develop as possible in my lifetime, and hope that some of that technology may even help us (as it already does) to live healthier, higher quality lives for a longer span.